AUDUSD is chiefly under the influence of some economic reports such as Private Sector Credit MoM and YoY in Australia and Employment Cost Index QoQ and Chicago PMI in the US. The support rests in 0.76550 with resistance at 0.76850 which both lines are below the weekly pivot point at 0.77110. The EMA of 10 is moving horizontally along the descendant channel and it is located below the EMA of 100 and the EMA of 200. The RSI is moving below the 50 level, the MACD indicator is in negative territory and the Stochastic is showing downward momentum. The ADX is showing weak buy signals. The price is below the Ichimoku Cloud and the Chinkou Span. The Tenkan-sen is showing a horizontal trend while the Kijun-sen is showing a downward trend. 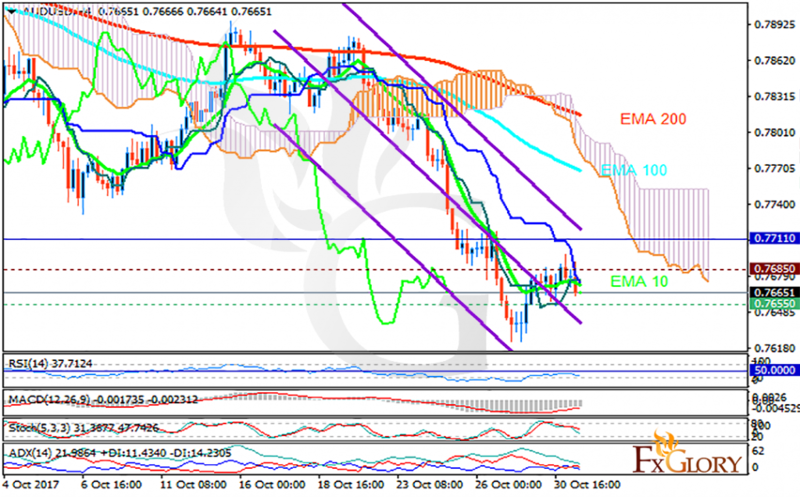 AUDUSD will continue its bearish trend towards 0.75; if the resistance level is broken, it will continue its bullish trend towards 0.78.